There has to be more to the story? Did your plane have one? What happened? Chris had one on his old plane, and now has a custom-built on his new plane. I have one. They are no longer made. For the stock Avid, I donno. I have parts and plans for two different custom ones for my Foxy, but wont fit yours. 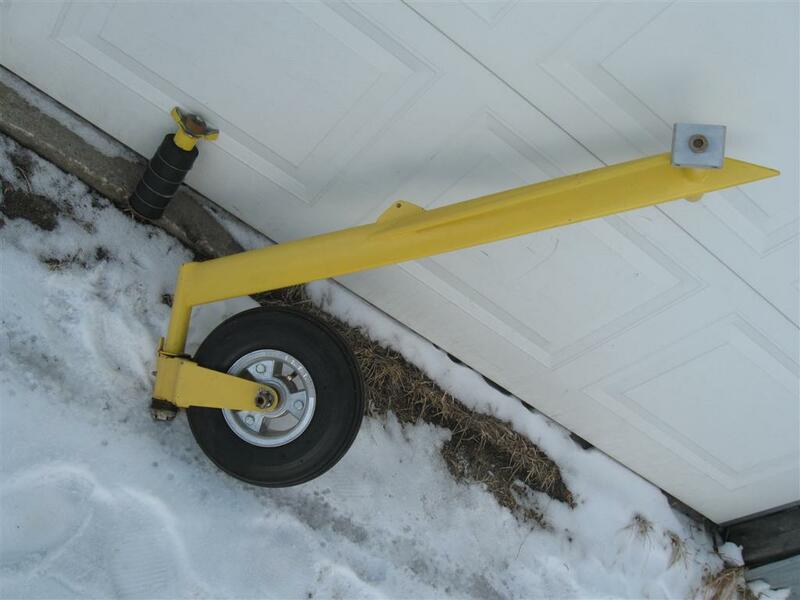 Do you have the mains set for nose gear? Amienoel put one on her plane. I see the photo of a normal-looking Yellow nose-dragger - Why do you need to replace the nose gear if it works fine? These nose gears are fairly scarce. Just trying to help. Is that a custom cover on the yellow Avid, or does someone sell them? Guess I should have asked the owner about the cover on the yellow Avid - wanted to know if it was commercial or homemade. 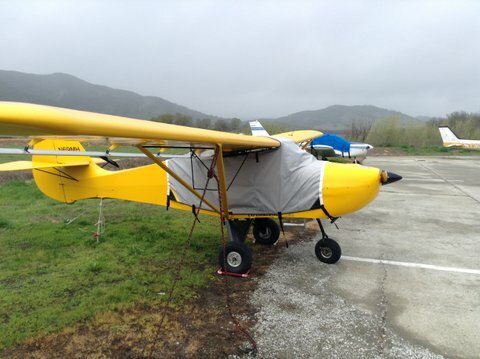 It looks just like my Bruce's Custom Cover I have for my Kitfox. They have them listed under Avid and SkyStar (for Kitfox). The cover is a "stock" "lightweight" (5 lbs) cover from Bruce's Covers for the Avid. I need the nose gear because the one on the Avid was bent while towing it through some grass that had a deep rut from a mower. Only advice I can give is to remove yours and fix or make a duplicate, unless someone has one for sale. ChrisB bought a RANS Tundra fork and made his. I've got a fork and pivot shaft for a Cessna 172, and a complete Piper TriPacer setup, and no idea of how close it would be to yours. Thanks for the info on the cover. Since I'd like to make a nose gear for mine (and also new main gear, since they are different for a nose gear configuration), depending on where you are at I'd be happy to help get the measurements and maybe make some drawings. I'm in central illinois, but travel for business a lot, so wherever you are may work at some point. The "Builders Manual Part 3" online in the forum has a drawing for the front fork and mains on page 5. I should mention that my nose-gear is not sprung, but is steerable by a bell-crank attached to the rudder peddles. Thanks for the tip on the manuals. Unfortunately, they won't open after I download them. Adobe complains the document root is missing or invalid. Sigh, it has been that kind of day. Maybe someone can get it and post it for you on Files and Forms? I just tried and it wont open for me either! my friend Max has a couple of original Avid Nose forks. He might be willing to let one go. I need to get him on this board. Does your original nose fork have the doubler installed? That was something everyone was supposed to do that strengthened it considerably. What is the diameter of the pivot tube - Not the support tube - I am still looking for a chrome tube. Yea, I looked at the downloaded pdf file, and somewhere in the various moves of the forum, they were transferred between systems with FTP using Text mode instead of Binary mode, so the end of line characters go messed up. Some characters that looked like end of line but weren't got wacked too, so reversing that process doesn't solve the problem. I'll try to salvage them in my spare time, but if someone has useable copies it will be a lot faster to repost them. Note - this is not a criticism of the forum in any way shape or form! Just a statement of what is wrong. Nobody appreciates more than I do the amount of effort and sacrifice that goes with maintaing/hosting a forum like this! Sorry guys, my laptop died but I have a copy of the manual on my computer at work... unfortunately, I wont be back at work for 2 more week so I wont be able to re-upload the files till then. Joey, if you have them downloaded on your computer maybe you can swap the files out. Hey guys, I just opened the files on the wifes laptop. Instead of saving them to your comuter, choose open files... then it opens just fine and you can THEN save the open fie to you comuter.. I don't know why it will open OK but not save right on a direct downoad. I think we both tried to "open" and it gives a "root missing" or similar error message - NO Can Do! Not trying to download - don't even kno what that means. I tried a long time ago and the files would not open for me then either. "Mark, you sound like you know a little bit about computers, you want another job "
I work on the all day long - that is why NO, I don't want another job!!! I get enough of this all day long! I play with airplanes, woodworking, metalworking, ANYTHING but computers after the work day is done!